Manufacturer of a wide range of products which include golden & silver color incense sticks, colored agarbatti and colored fragrance agarbatti. With the constant assistance of skilled and experienced professionals, we are involved in offering an excellent quality array of Color Incense Sticks to our patrons. As per defined industry standards, these sticks are manufactured by dexterous professionals using quality approved basic material and modern tools, technology. Our offered sticks are highly demanded in the market for their fine finishing and top notch quality. We are renowned as the most popular organization in this domain, offering a wide array of Color Agarbatti to our clients. The agarbatti offered by us are made using premium quality components and the modern technology in compliance with the industry standards. Additionally, our offered agarbatti can be customized in various sizes to cater the diverse demands of our valuable clients at pocket friendly price. 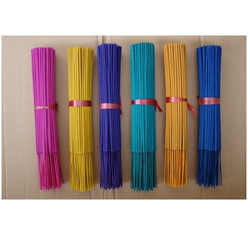 We are leading manufacturers of the Colored Fragrance Agarbatti.